If You Want to Empower Employees, Hold Them Accountable and Finally – LET GO … Use This Complete, Step-By-Step Blueprint to Delegate Without Feeling Like You're Passing Off "Busy Work" or Being Perceived as a Paranoid Micromanager. If it did, we'd all be doing it with ease. You see, our brain automatically resists sharing tasks. It's odd but true. And the millions of articles and hundreds of books on the subject prove we need help with this crucial management activity – and are constantly in search of the answer. 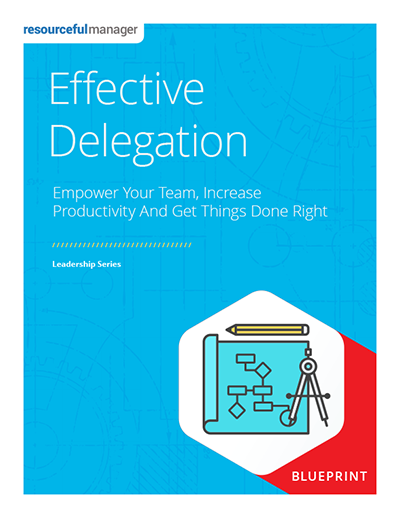 The good news: delegating is an acquired skill. The challenge is it comes with a steep learning curve – especially if you consider yourself a "doer." How to give instructions so the person "gets it"
What happens when you don't delegate – the cost of not "letting loose"
Sign in if you have an account. 17 Blueprints (PDF) – detailed, step-by-step frameworks, advice and recommendations for navigating everyday management challenges and difficult situations. 9 Essential Insights (PDF) – concise, 20- to 30-page executive summaries that deliver quick tips, distilled research and curated knowledge on a specific topic. 90 Practical Tools (PDF) – desk references such as checklists, worksheets, scripts, and more to help implement new ideas. Bridging the gap between advice and execution. Quality, reliable information you can trust – professionally curated, distilled and delivered to you all in one place. From bite sized pieces of wisdom to full on training series, I highly recommend Resourceful Manager! This is one of the best resources I have had as a people manager and use it frequently. I find good guidance and information to use and share. Quick actionable advice backed by research. I also appreciate the common format of the blueprints and depth that is available to make implementation dynamic to my application (I don't feel like I have to change the world at once). Chapter 1: "How Can I Trust Someone Else To Get The Job Done As Well As I Can?" How to select the ideal person for each task and finally feel comfortable "letting go"
How to delegate small tasks without people feeling like you are just passing off your "busy work"
Chapter 2: "Do I Give Incomplete Instructions Or Do They Not Understand?" 7-step process to give instructions so the person "gets it"
Should you give verbal, written or hands-on instructions? How to get someone to complete the delegated task just how you like it – without explicitly telling them to "do it this way"
Chapter 3: "How Do I Get My Employees To Take Accountability And Stop Running Everything By Me?" This Blueprint will walk you step-by-step through the entire delegating process, and the Practical Tools listed below help you implement that knowledge in the real world. The result: Your team will willingly take on new tasks and have more energy – and you will finally toss that "I need to do it all" monkey off your back. ResourcefulManager's "Effective Delegation For Busy Managers" Blueprint comes with an unconditional, 100% money back guarantee. We're confident you’ll find several new and useful ideas to help you navigate employee terminations, presented in a practical, easy-to-implement format. In fact, we'll give you a full 90 days to carve out the time in your busy schedule to read the Blueprint, digest the strategies, put the advice into action, and experience the results in your specific situation. We believe to be a great manager … is to be resourceful. So every piece of content and product we create is designed to make you more knowledgeable, prepared and into. Just for the record, as of this year, we’ve sold 6,200+ ResourcefulManager products and have a refund rate of only 1%. If you decide "Effective Delegation For Busy Managers" Blueprint doesn't deliver value or simply isn't your cup of tea, just email us at contact@resourcefulmanager.com within 90 days, and we'll process your complete, no-hassle refund in 1 business day or less. But I'm confident you won't need to.